Ophiocordyceps unilateralis infection of a Formicidae. Used under public domain licensing. 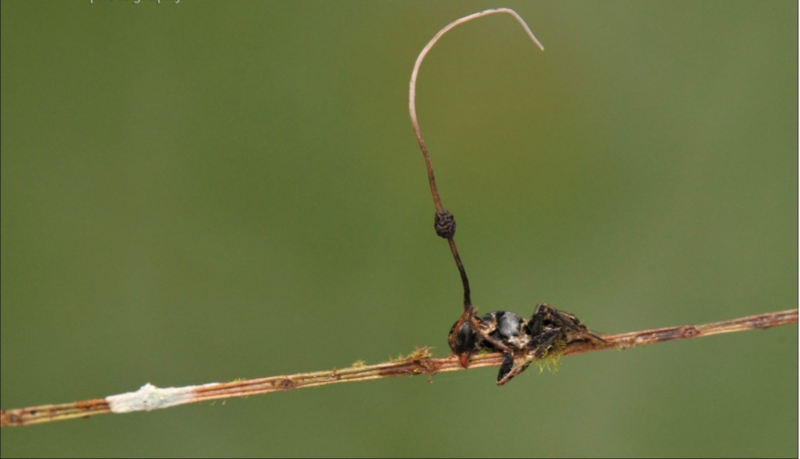 Ophiocordyceps unilateralis is an entomopathogen that is a part of the Ascomycota phylum (Evans et al. 2011; Barbosa et al. 2015). The fungus is often found in tropical forests and is characterized by a single stalk that grows out of the dorsal neck region of the ant (Evans et al. 2011; Barbosa et al. 2015). Formicidae biting down on vegetation as a result from an Ophiocordyceps unilateralis infection. Used under public domain licensing. To start out the reproduction of the spore, the fungus must land on an ant or be picked up in the soil, then the infective hypha drill through the exoskeleton of the ant using enzymes like lipase, chitinase, and protease (Evans et al. 2011). After this phase the fungus grows as free-living yeast cells in the hemocoel of the insect, this is estimated to last for a few days. These yeast cells produce nerve toxins that actively change the behavioural activity of the living ant (Evans et al. 2011; Araujo et al. 2015; Barbosa et al. 2015). The ants will begin to wander away from their colony, they will also start climbing and chewing vegetation (Evans et al. 2011; Araujo et al. 2015; Barbosa et al. 2015). In order for the fungi to successfully reproduce the ant must die. The ant will die on the vegetation, clamping down with its jaw, known is the “death grip” this ensures a stable home for the fungi to grow its fruiting body (Hughes et al. 2011). The stroma of the fungus will begin to grow out of the dorsal neck region of the ant and form a fruiting body known as the perithecia where the spores are produced (Hughes et al. 2011). When ready the spore will be released to the ground below, hoping to land on more ants to complete the cycle (Evans et al. 2011; Hughes et al. 2011; Araujo et al. 2015). This unique relationship between the fungus and the ant is one of the most dramatic cases of a parasitoid controlling its hosts behaviours (Hughes et al. 2011). 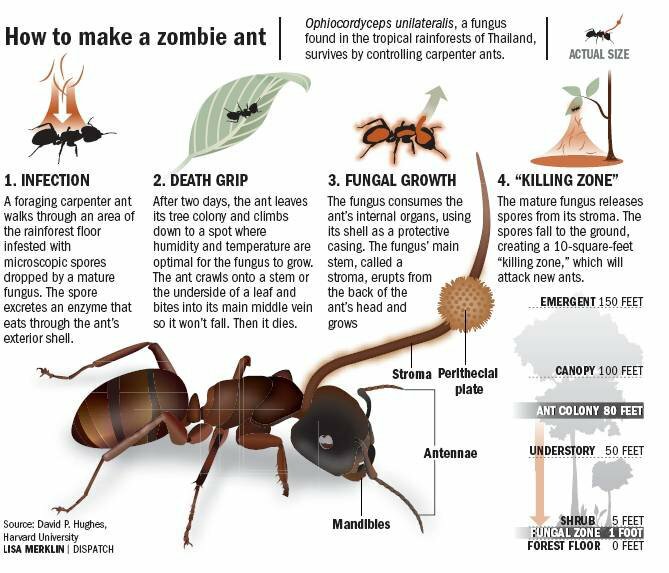 How to make a zombie ant. A breakdown of the lifecycle of Ophiocordyceps unilateralis and the side effects of its host Camponotus. Photo by David Hughes at Microbe Wikipedia. Used under creative commons licensing 2.5. Both the parasite and the host have developed adaptations to outcompete each other. Andersen et al. (2009) observed that Camponotus leonardi ants were often found dead at optimal temperature and humidity conditions for the fungi, who has behavioral control over the ant before it dies. This adaptation allows the fungus to be at an optimal fitness to produce large, successful fruiting bodies. The ants have also coevolved with Ophiocordyceps unilateralis, studies have shown that the ants have started to sense when one of their colony members is infected (de Bekker et al. 2014). Once sensed, the infected ant will be carried far away from the rest of the colony to decrease the spread of the fungus (de Bekker et al. 2014). The ants will also practice cleaning one another to decrease the presence of spores on their exoskeletons (de Bekker et al. 2014). This is a prime example of the co-evolution between a parasitoid and its hosts (Andersen et al. 2009; de Bekker et al. 2014). Ophiocordyceps unilateralis produces a secondary metabolite called naphthoquinone​ which has been studied for its antibacterial, antiviral, anti-fungal, anticancer, and antimalarial activities (Amnuaykanjanasin et al. 2011). Two derivatives of napthoquinone showed antiviral activities in the poliovirus, influenza A virus and, the herpes simplex virus (Tandon et al. 2004). There is also potential for antifungal activities since some of the napthoquinone derivatives contain a sulphur atom which is known for its anti-fungal properties (Tandon et al. 2004). There was also found to be anticancer properties in one of the napthoquinone derivatives against lymphoid leukemia (Tandon et al. 2004). Though these finding are relatively preliminary, testing the active properties in the fungi can lead to potentially new and effective pharmaceuticals in our society. Naphthoquinones have also been the focus of anti-malarial treatments, quinones have widely been studied for their anti-malarial properties. Tonic water, containing quinones, has been used for a preventative treatment for malaria. Therefore, if we could extract these quinones from the fungus we could have another source for antimalarial drugs. Napthoquinones also have a potential use in cosmetic and commercial industries, this is because these compounds have a deep red pigment (Prathumpai et al. 2006). Under acidic conditions napthoquinones show a red colour and under basic conditions shows a purple colour. These pigments are stable against acid and alkaline conditions, these make it a safe and alternative source for food colouring as well as dyeing of other materials in the commercial industry (Prathumpai et al. 2006). Polyketides are a secondary metabolite that have been extracted from fungi and studied for their uses in pharmaceuticals (Amnuaykanjanasin et al. 2009). Polyketides have been used in antibiotics, cholesterol medication, and anti-fungals (Amnuaykanjanasin et al. 2009). Ophiocordyceps unilateralis produces polyketides as a secondary metabolite, therefore they hold the potential to hold these medicinal properties (Amnuaykanjanasin et al. 2009). Overall, Ophiocordyceps unilateralis contains various known metabolites, these natural products are currently being investigated as potential sources for immunomodulatory, anti-tumor, hypoglycemic, and hypocholesterolemic pharmaceuticals. Cover of the video game The Last of Us. The cover art copyright is believed to belong to Sony Computer Entertainment and Naughty Dog. Creative commons licensing on Wikipeidia. The Last of Us is a play station game that came out in 2013. The synopsis of the game is to survive in a world that has been overtaken by a zombie like fungus, turning all humans it infects into zombies. Director Bruce Straley and creative director Neil Druckmann had knowledge of Ophiocordyceps and knew they infect many species: ants, spiders, caterpillars, stink bugs. So he embellished on this idea and made a game that incorporated a “zombie fungus” that had the potential to infect and control humans (Naughty dog 2017). The similarities to this fungus can be seen in the animation of the zombies in the game. In the figure below you can see the stroma I previously described, growing out of the zombies’ head, as well as the perithecia where the spores are produced. An animated picture of a zombie in the game The Last of Us. 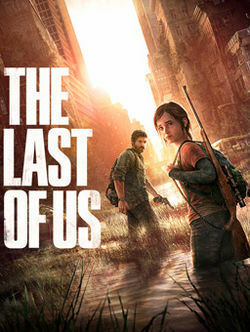 The cover art copyright is believed to belong to Sony Computer Entertainment and Naughty Dog. Creative commons licensing on Wikipeidia. Overall, Ophiocordyceps unilateralis has been a focal point of study, known for its unique characteristics and parasitic relationships. This relationship is one of the major examples for a parasitoid that can control its host’s behavior. 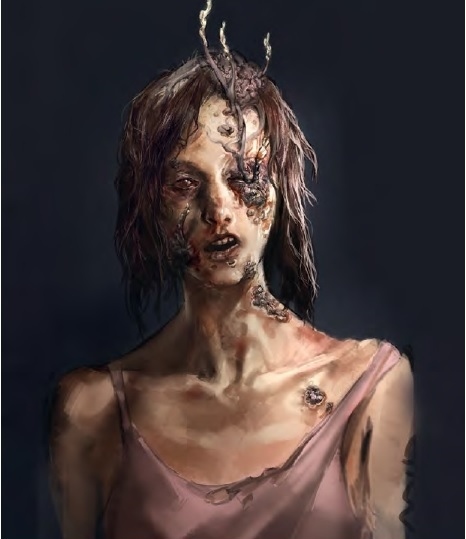 The fungus has even been a focal point in video games, highlighting these unique abilities as human zombies that infect others by emitting spores. More recently, Ophiocordyceps unilateralis has been involved in studies looking at their secondary metabolites as a source in the pharmaceutical industry. Though, must of this research is still in the preliminary stages, there is still lots of potential present. Amnuaykanjanasin, A., Panchanawaporn, S., Chutrakul, C., Tanticharoen, M., (2011) “Genes Differentially Expressed Under Naphthoquinone-Producing Conditions In The Entomopathogenic Fungus.” Canadian Journal Of Microbiology 57: 680-692. Amnuaykanjanasin, A., Phonghanpot, S., Sengpanich, N., Cheevadhanarak, S., Tanticharoen, M. (2009) “Insect-specific polyketide syn- thases (PKSs), potential PKS-nonribosomal peptide synthetase hybrids, and novel PKS clades in tropical fungi” Applied and Environmental Microbiology 75:3721–3732. Andersen, S., Gerritsma, S., Yusah, K., Mayntz, D., Hywel-Jones, N., Bilen, J., Boomsma, J., Hughes, D. (2009) “The life of a dead ant: the expression of an adaptive extended phenotype.” AM. Nat. 174:424-433. Araújo, J., Evans, H., Geiser, D., Hughes D. (2015) “Unravelling the diversity behind the Ophiocordyceps unilateralis (Ophiocordycipitaceae) complex: Three new species of zombie-ant fungi from the Brazilian Amazon.” Phytotaxa 220: 224-238. 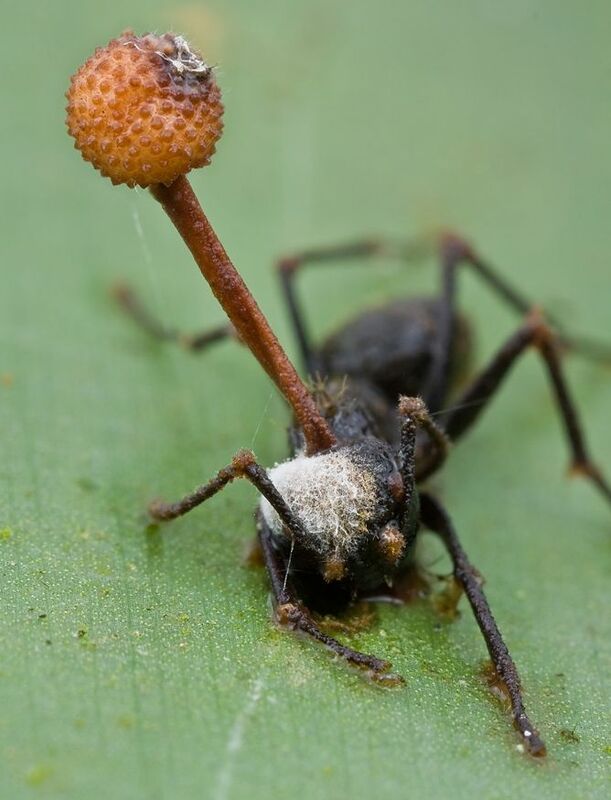 Barbosa, B., Halfeld, V., de Araujo, M., Maciel, T., Prezoto, F., (2015) ” Record of Ophiocordyceps unilateralis sensu lato, the zombie-ant fungus, parasitizing Camponotus in an urban fragment of Atlantic Rainforest in southeastern Brazil.” Studies on Neotropical Fauna and Environment 50: 21-23.
de Bekker, C., Merrow, M., Hughes, D., (2014) “From Behavior to Mechanisms: An Integrative Approach to the Manipulation by a Parasitic Fungus (Ophiocordyceps unilateralis s.l.) of Its Host Ants (Camponotus spp. ).” Integrative and Comparative Biology 54: 166-176. Evans, H., Elliot, S., Hughes, D., (2011) “Ophiocordyceps unilateralis: A keystone species for unraveling ecosystem functioning and biodiversity of fungi in tropical forests?” Communicative & Integrative Biology 4:598-602. Hughes DP., Andersen SB., Hywel-Jones NL., Himaman W., Billen J., Boomsma JJ. (2011) “Behavioral mechanisms and morphological symptoms of zombie ants dying from fungal infection.” BMC Ecology 11:13. Tandon, V., Singh, R., Yadav, D. (2004) “Synthesis and evaluation of novel 1, 4-naphthoquinone derivatives as antiviral, antifungal and anticancer agents.” Elsevier 14: 2901-2904. Prathumpai, W., Khongchay, P., Srikitkulchai, P., Wongsa, P., Theeranatheekulchai, P., Wongsa, P. (2006) “Kinetic Study of Naphthoquinone and Key Metabolite Production of C. Unilateralis BCC1869.” Thai Journal of Biotechnology 7: 39-43. This work by Alex Mckenna is licensed under a Creative Commons CC-BY Attribution 4.0 International License.